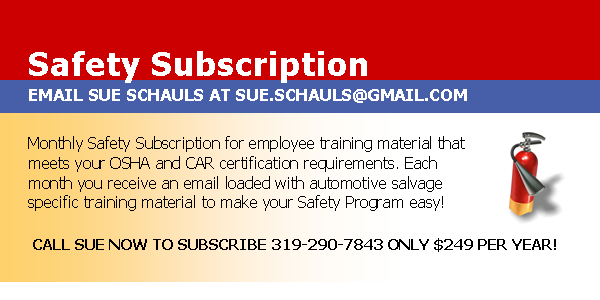 ​To meet these safety training needs, Sue Schauls Consulting has introduced the Safety Subscription service. The Safety Subscription is available to any automotive recycler for the subscription price of $249 per year. The Safety Subscription is a monthly safety email that includes one safety topic and an employee training log. To subscribe send an email to Sue Schauls. Compliment your current safety program with this Monthly Safety Subscription. • Order a prefilled Safety Binder for $39 and receive 3 month free Trial Safety Subscription. The Safety Subscription for Salvage facilities meets the ARA CAR program standards. This service is available for $249/year by subscription delivered via email each month. June 1, 2016 OSHA Safety Deadline is approaching for phase-in date required under the revised Hazard Communication Standard (HCS): Employers must update alternative workplace labeling and hazard communication program as necessary, and provide additional employee training for newly identified physical or health hazards. Starter kits available for $39 - Order a prefilled Safety Binder by emailing Sue Schauls. but represent an ongoing effort that continually promotes a safe working environment. The Iowa Certified Automotive Recyclers Environmental (I-CARE) Program and the ARA Certified Auto Recyclers (CAR) program requires that participating automotive salvage facilities conduct occupational safety and health employee training as mandated by federal and state OSHA rules as well as training on the safe use of gas cutting torches, if used at the facility. Additionally, some environmental regulations require employee training be conducted annually and documented to maintain compliance.